Edited by bestselling anthologist John Joseph Adams, Lightspeed is a critically-acclaimed online magazine. In its pages, you will find science fiction from near-future stories and sociological SF, to far-future and star-spanning SF. Plus, there's fantasy from epic sword-and-sorcery and contemporary urban tales, to magical realism, science-fantasy, and folktales. Each month, Lightspeed brings you a mix of originals and reprints, and featuring a variety of authors — from the bestsellers and award-winners you already know to the best new voices you haven't heard of yet. When you read Lightspeed, you'll see where science fiction and fantasy come from, where they are now, and where they're going. 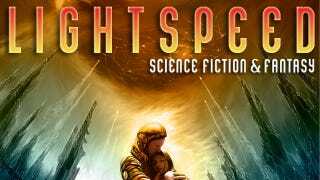 For more new fiction, as well as access to back issues and ebook editions, visit Lightspeed Magazine. You can catch new Lightspeed content here on io9 once a month.